Tampa Bay Buccaneers All-time player records for Rushing, Receiving, Passing, Scoring, Kick & Punt Returns, Touchdowns, Sacks and more. The first NFL draft began at the Ritz-Carlton Hotel in Philadelphia with ninety names written on a blackboard in the meeting room from which the teams would choose. As no team had a scouting department, the list was created from either print media sources, visits to local colleges by team executives, or by recommendations to team executives. The draft would last for nine rounds, and it had no media coverage. The first player ever selected in the draft was Jay Berwanger. Bell, prior to the draft, was not successfully able to negotiate a contract with Berwanger so Bell traded him to the Bears. George Halas, owner of the Bears, was also unsuccessful in signing Berwanger. Berwanger's decision to not play in the NFL was not unusual, as only twenty-four of the eighty-one players selected chose to play in the NFL that year. The draft was recessed on the first day and it was continued and finished on the next day. 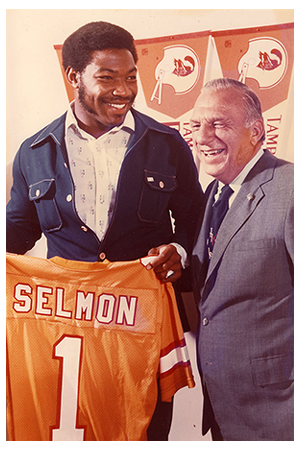 The Buccaneers selected future Hall of Famer Lee Roy Selmon with their first ever draft choice in 1976. He was a consensus All-American at Oklahoma in 1975 and was named the most outstanding college lineman winning both the Lombardi and Outland Trophies. Selmon immediately established himself as the leader of the Buccaneers defensive unit. He was dominant from his right defensive end position and helped produce two NFC Central Division championships in the team's first six seasons. Selmon was named first- or second-team All-Pro and All-NFC five times. He was also selected to six straight Pro Bowls from 1980 to '85. The NFL Players Association named Selmon the NFC Defensive Lineman of the Year four times and he was a unanimous choice as NFL Defensive Player of the Year in 1979. The Bucs also had the first overall pick in 1977. This time they used their selection on Southern California running back Ricky Bell who was the NCAA’s leading rusher in 1976. The hope was that Bell would provide Tampa Bay’s offense with a much needed playmaker. Bell found moderate success during his first two seasons (1,115 rushing yards in 1976 and '77). The resilitent Bell saw great success in year three. He rushed for 1,263 yards, caught 25 passes for 248 yards and scored nine total touchdowns in 1979. Bell's effort helped Tampa Bay win the NFC Central and make the playoffs for the first time in franchise history. The Bucs faced off against the Philadelphia Eagles in the divisional round of the playoffs and Bell carried the load. He rushed for 142 yards and two touchdowns as Tampa Bay advanced to the NFC Championship game following their 24-17 victory over the Eagles but eventually fell to the Los Angeles Rams in the NFC Championship Game. The story of Tampa Bay’s selection of Bo Jackson with the first choice in the 1986 NFL Draft is one of the most unusual in NFL history. Jackson, a Heisman-winning running back out of Auburn, was hands down the highest rated prospect in that year’s talent pool. Jackson, however, had no intentions of playing with the Buccaneers and clearly communicated his feeling to the team. The Buccaneers still did not waver and selected Jackson with the first pick. Jackson stood by his word, he did not sign with the Bucs. He instead shifted his talents to baseball and the Kansas City Royals who drafted the gifted outfielder in the 4th round of Major League Baseball’s amateur draft. The Buccaneers’ rights to Jackson were eventually relinquished but most teams assumed Jackson would never return to football. The Los Angeles Raiders, however, took a chance and selected the running back in the 7th round of the 1987 draft. From there Jackson, soon to be a two-sport megastar, went on to be one of the biggest pop icons of his era. The Bucs tabbed All-American Miami quarterback Vinny Testaverde with the first overall pick in 1987. Testaverde immediately won the starting role and played six seasons with the team completing 1,126 passes for a franchise record 14,820 yards and 77 touchdowns. In 2015 the Buccaneers selected Florida State and Heisman-winning quarterback Jameis Winston with their first overall pick. It would be the third time the team had selected a Heisman winner with the number one overall pick.